Kristy took a red-eye back from San Diego, landed at Dulles International at about 0600 and I picked her up at about 0620. We arrived at the Bradley Pond trailhead in the Upper Works at about 1500 and started up Santanoni Drive toward the Bradley Pond Trail to Duck Hole at about 1530. We reached the Bradley Pond Lean-To at about 1900 with a good two hours left before dark and found the entire camping area empty. Brand new gaiters - worth their weight in gold! We got up at about 0530 and were on the trail at about 0600. It took us a good half hour to find the swayback rock that marks the beginning of the herd path up Panther Creek. Once we found it, the swayback rock was easily recognizable, but it was significantly further South of the Lean-To than we had expected. Shown below, foliage surrounding the swayback rock has grown significantly from earlier pictures we'd seen before the trip and enterprising hikers have since erected a small cairn on the swayback rock. Panther Brook Trail: Relentless. Referring to the graph recreated from our GPS track, the swayback rock is near the first little maximum out of the Bradley Pond Lean-To on the morning of the 8th. It's just shy of the 5 mile mark for total trip distance. A brief loss of elevation on the Panther Brook Trail and the relentless climb begins resulting in a total vertical ascent of about 1500 ft in about 1.2 miles. That's an average grade of about 24%. The last quarter is at a 23% grade. All in all, it's only a little over a mile, though, so although the pitch is relentless, including negotiation of large boulders due to the trail's intimate association with Panther Brook for all but the last quarter mile, it doesn't take up a terribly large fraction of your hike and you arrive at the top of the Panther Brook Trail in good spirits and excited about the peaks ahead. 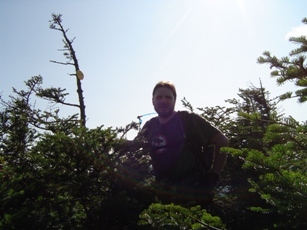 Panther Peak: This is an easy and quick climb once you've reached the ridge line - a hard right from the top of the Panther Brook Trail. 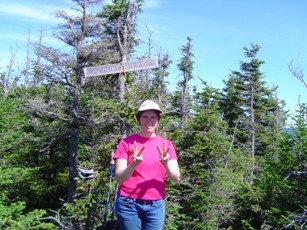 Like many Adirondack peaks, however, there is a bit of a false summit. After probably 15 minutes of quite easy hiking with a few rock scrambles one last rock scramble takes you up to a large open rock face that appears at first to be the peak. The views were quite nice including views of Long Lake, abandoned mines, etc. Once up on the open rock, an approximately 50 yard hike down off the rock and through a swampy area leads to a plateau slightly lower than the open rock but with a four foot tall rock the top of which is slightly higher than the open rock face. 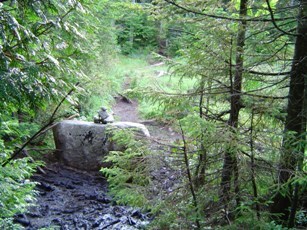 This rock is surrounded by pine and has little or no views. From the open rack face we were able to see Couchsachraga easily. Many have reported this as a depressing view seeing how much lower Couchsachraga Peak is from your current position and knowing it to be a "counterfeit" peak at only 3820 feet. It is. 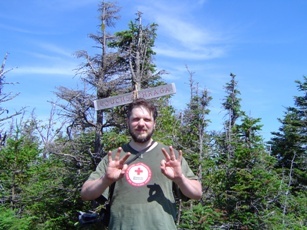 Times Square: A quick trip down off of Panther Peak to the top of the Panther Brook Trail and we arrive exactly when another hiker finishes the climb. As he comes up onto the ridge line the abrupt change from the almost 25% grade to the remarkably flat ridge line is almost overwhelming and it shows on his face. 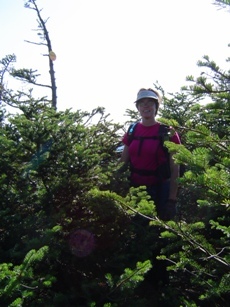 Now I know what the look on my face was when we first hit the ridge line! Continuing straight on from the descent of Panther Peak, a hard left from the top of the Panther Brook Trail, Times Square is just a few hundred yards ahead. We arrived at Times Square to see that some helpful hiker earlier that morning or the afternoon before had carved arrows into the exposed earth identifying the trailheads to Couchsachraga and Santanoni Peaks. Off to Couchsachraga! Couchsachraga Peak: Down... down... down. Over half the distance we'd recently come up the Panther Brook Trail gone! The grade was a bit more relaxed, but still! A loss of almost 1000 feet from Panther Peak before hitting the bottom col about 1 mile from Times Square. Then up... and down... and up... and down... and up, through a swamp, and the peak. The sign was kind of nice. Highly un-climactic except, of course, for knocking off one more peak. As promised the swamp below the peak was remarkably less difficult than conditions we'd experienced on the Bradley Pond Trail and the swamp was only a few tens of yards across. Once again, the gaiters were indispensible. 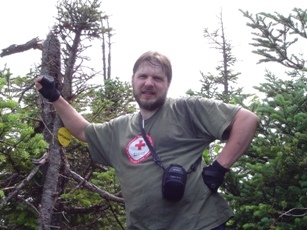 The views are generally bad, though you can, not surprisingly, see Panther Peak and *maybe* Santanoni Peak. There are several false summits on the way to Santanoni and I couldn't convince myself if I was seeing the real summit or not. The climb back up to Times Square was at times a bit wearing - 4 miles of that much climbing can be tiring. 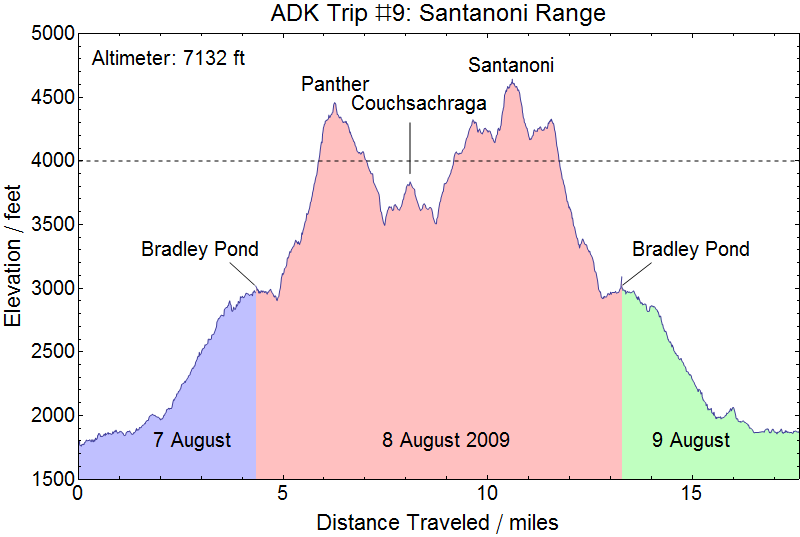 Santanoni Peak: Arriving back at Times Square highlighted its name. We ran into hikers we'd seen earlier in the day at this point, and returning back to Times Square after having reached Santanoni Peak we again ran into hikers we'd seen earlier in the day. For my taste, there could have been a lot less up-and-down on the path the Santanoni. But as soon as you complain about all of the up-and-down the trail hits you with all up! The last major ascent is a nearly 20% grade for about 0.3 miles gaining 450 feet. Ooph! But you eventually come back out on a high ridge - two false summits later and you're there. As with Couchsachraga, the peak is surrounded by pine and offers little in the way of views. A little lower, near the highest false summit, is a cliff that offers very nice views of the valley south of Santanoni. The banner picture on this page is one of those views. Shortly after leaving Santanoni Peak for good we ran into two young ladies heading up. A brief conversation explaining they had only one last false summit and were within a few minutes of the peak and in which we found out that they had set up in the Bradley Pond Lean-To (and they found out that the gear they had found there was ours) and we were off again. Bradley Pond Lean-To: The trip back down to Time Square was not as fast as we would have liked. Steep down is usually slower than steep up, oddly enough, especially at the end of the day. But we made it back to the top of the Panther Trail in due course and started down yet another long, slow descent. The two young ladies we had met near Santanoni Peak passed us about half-way down where we had stopped to refill our water packs. We arrived back at the Bradley Pond Lean-To with about 90 minutes until sundown, so a good 2 hours before true dark. If we didn't have all of our overnight gear left to pack up and the Bradley Pond Trail back out to Santanoni Drive wasn't the muddy nightmare we knew it to be from the previous days hike we'd have bolted out to the car, but we were happy to relax, enjoy a cooked meal, and spent a well deserved night of rest in the Lean-To. 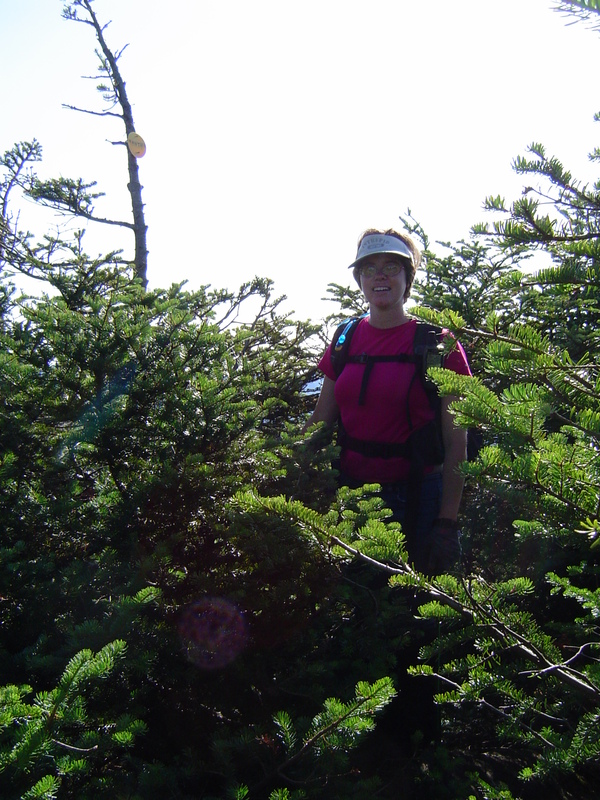 Lots of great conservation with our Lean-To companions revealed that one from Burlington had completed more than 40 peaks and was on her final trip to finish the Adirondacks. Her companion was from Oregon and was not surprisingly knocking off the 46 at a much slower pace, but had some great stories about hiking in the Rockies. 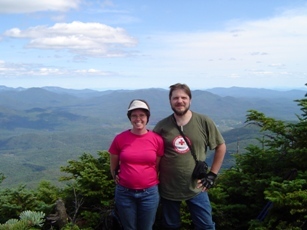 We regaled them with stories of our very green early hikes in the Adirondacks (coming soon to Trip #01!). Up at 0530 packing as quietly as we could to disturb our companions as little as possible - on the trail with Pop-Tarts in hand by about 0630. The Bradley Pond Trail out to Santanoni Drive was MUCH worse than we had remembered it. We've experienced this many times before. I don't think the trail was truly much worse but that one tries to be much more optimistic on the trip in knowing there is a lot of effort ahead and the trail in is a bad time to decide you're not having a good time! But the trail out also always has the benefit of being relatively short in perspective to the entire trip and has the promise of car/home/shower at the end of the line. So it's never that bad. But it WAS a horrible trail and, if I haven't made it absolutely clear before, GAITERS ARE A NECESSITY! For all of the complaints I've heard about mud and generally poor trail conditions on the Santanoni Range we found them to be a sheer JOY compared to the Bradley Pond Trail. The ladies we met on the hike in were ABSOLUTELY right about that. As often occurs, the trip home took about two hours longer than necessary due to horrible traffic starting about half-way through New Jersey and most of the rest of the way through Delaware and Maryland to Northern Virginia. Next trip: Heaven knows! 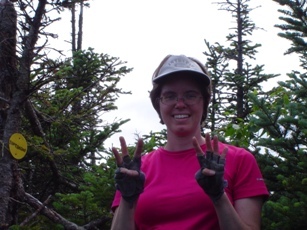 Kristy was three months pregnant at the time of the hike. We have great aspirations to take one or possibly two extended trips next year (car + pack in on day one, peaks on day two, pack out + car on day three is not a temporally economical way to rack up peaks when you live in Virginia!) and actually finish the remaining twelve. It's possible. But with two children at home (including a new born being breast fed) that's difficult at best!